The Museum of International Propaganda features a permanent collection, as well as special exhibitions, of propaganda posters, paintings, sculptures and items from multiple countries. 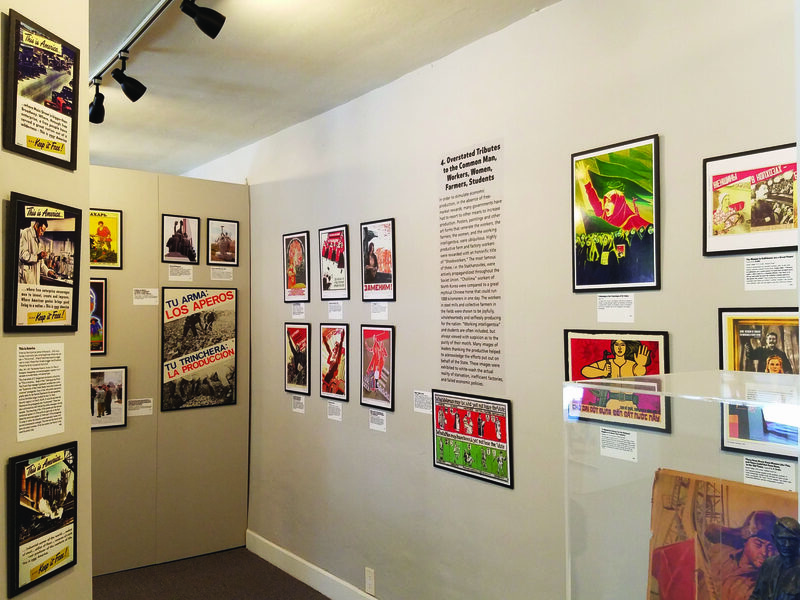 While Lilka and Tom Areton didn’t quite time the opening of their museum dedicated to propaganda to highlight the current zeitgeist, the freshly opened Museum of International Propaganda in San Rafael couldn’t come at a better time: Election year. Bright, inviting and highly educational, Marin County’s newest museum is all about the stuff that once made elections victories and regime changes, and couldn’t be more poignant in 2016. “Propaganda is the calculated manipulation of information designed to shape public opinion and behavior to predetermined ends, as desired by the propagandist. It is usually emotional and repetitive, either designed to increase enthusiasm for a proposed utopian world or to escalate rage and hatred against a designated enemy,” the longtime Marin County residents, parents of three and avid travellers, explain on the museum’s website. “Subjectivity, disinformation, exaggeration, and the outright falsification of facts are the hallmarks of propaganda practitioners.” Sound familiar? Tom, who studied at the Comenius University in Bratislava, Slovakia, and, later in the U.S., took up film study at NYU and Law and Economics in San Francisco, “was born in Czechoslovakia by a cosmic error and always felt he was an American,” Lilka jokes. She has a Ph.D. from San Francisco’s Institute for the Advanced Study of Human Sexuality. The academic background led the two to start a student exchange nonprofit in 1977, currently named Cultural Homestay International, and based in San Anselmo. In 1980 the couple went to Japan and started bringing school groups on summer programs to California. By 1987, they brought almost 12,000 students from Japan to the U.S. in one year. The couple’s collection of propaganda artifacts slowly grew in the process, and spans more than 104 countries. The collection of propaganda at The Museum of International Propaganda has taken the founders more than 30 years to compile. Photo courtesy of The Museum of International Propaganda. Plans for the museum are exciting—the two have already screened the bittersweet comedy Goodbye Lenin!, and will host future movie nights, as well as guest speakers and lecturers who will lead debates. A Free Speech Café is also in the works, and will open in a few months—an image on the museum’s website suggests that instead of the customary heart or smiley design in the foam, the cafe’s latte might have the face of Cuban superstar Che Guevara. Indeed, humor is an inevitable flipside of propaganda, with exhibits, according to Lilka, ranging from “the funny to the creepy.” In the creepy category are vilification posters reading things like, “Alaska, death trap for the Jap.” On the funny side, Chinese Cultural Revolution and Iranian “brazenly anti-American” posters can be found. Do they find the whole thing highly relevant, as well? “Almost everyone coming in suggests I put up some faces and some propaganda from our elections today,” Lilka says. “Our elections are propagandists’ bread and butter.” And while the museum’s exhibits are limited to the political propaganda of the 20th century, “Propaganda and propagandists are active and well all around the world and in every country. The propagandist will have succeeded, when people, toeing the propaganda line think they are acting of their own free will,” she adds. Now this would be a nice addition to your morning mindfulness practice, from now until November 8. The Museum of International Propaganda, 1000 Fifth Ave., San Rafael; 415/310-1173; propagandamuseum.net.